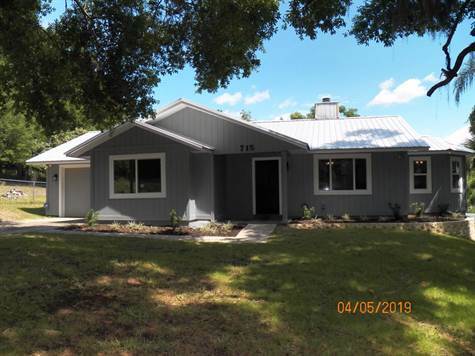 Wonderful 3 bedroom 2 bath home in walking distance to downtown Clermont with view of Crystal Lake! Beautiful wood burning fireplace in the living room and great lake views from the kitchen and dining rooms. Newly renovated and finishing touched being done now. Very energy efficient home with recent top of the line Trane 19.5 seer multi-speed condenser and the very top of the line air handler. Recent lifetime insulated windows. Recent metal roof. Complete new kitchen with granite tops, stainless appliances with gas stove. New knockdown ceiling and wall texture and freshly painted inside and out. New fixtures and upgraded baseboards throughout. Renovated baths with new vanities, fixtures and ceramic tile. New carpet in the bedrooms and new laminte wood flooring throughout the rest of the house. Recent Rannai tankless gas water heater too! The screened porch has just been redone and there is always a great breeze and beautiful lake view. The single car garage is over-sized for storage with washer and dryer hook-up and a refrigerator.